I think that’s whats got the Count all a Buzz !!! Oh-Oh, Lucy had already earned her horns! And at such a young age! Dear Oh Dear, what can we say, except that we have one just like her and her name is TESSIE!! She ruined more shoes, furniture, books, clothes, rugs, that you can shake a witch’s broom at when she was 8 weeks old up until she was 1 years old Now she is a very SPOILED Diva! Riley was adopted at 9 months so he was past his “chewing up everything in site” stage, but he is still into barking at, and chasing bikes, skateboards, skaters, scooters, motorcycles, and joggers! Honestly, how he embarrasses me with the craziness he exhibits when these things rush by!! Good thing Lucy is awfully CUTE—-even with her horns! Our twins live in California. Maybe this is why Lucy does not like wearing head wear–she is able to hide her horns better now, but the bows, hats etc, are painful against the horns. Lucy, you are a major DIVA! I think Mom is laughing hysterically over her little joke. I think a major tantrum….I mean trick of course, is in order….just please remember this is Mom’s going……not Brother’s. How come you are over loaded with crickets at your house? Did Lucy lose her pitchfork? Are you really a devil? We don’t think it is true. Sophie, on the other hand, could fit the title perfectly. I am to Brother, sometimes but not Mom and Dad. Look at that face! 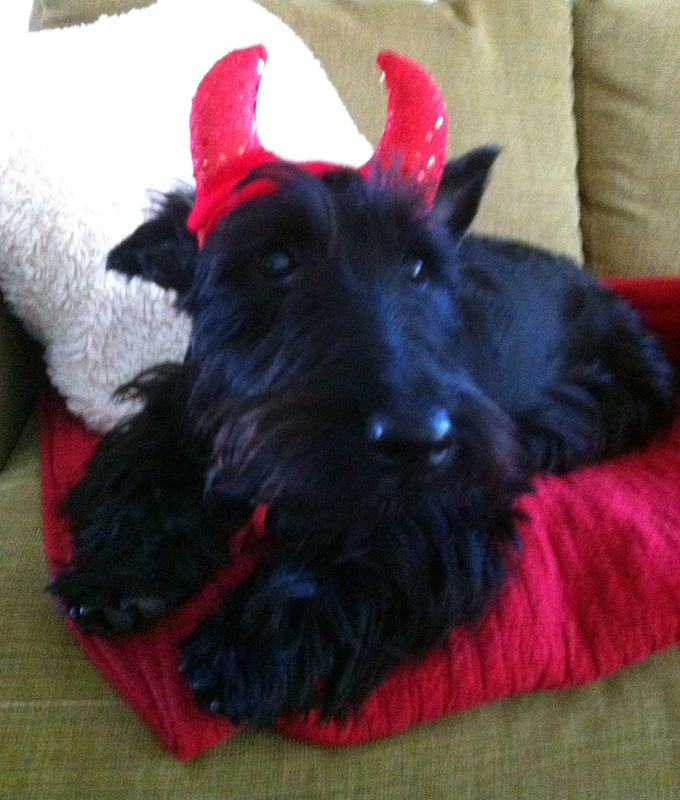 Lucy, we think your costume makes you look like an angelic devil. Mischievous you may be, but never devilish!